Want to take advantage of the channel with an average ROI of $40 for every $1 spent? Using Mautic is one of the quickest ways to keep in touch with your leads and customers right in their inbox. Q. Can I bring my lists over from another email service provider? Q. Does Mautic support autoresponders? Q. How much can I save with Mautic email marketing? Q. 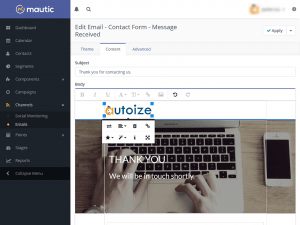 Does Mautic offer a WYSIWYG email editor? A. Of course. Mautic supports list imports from any email marketing platform that allows you to export your contacts as a .CSV file. We have migrated clients coming from MailChimp, Aweber, Constant Contact and many others. A. Yes. Because Mautic is not just an email service, but a full-blown marketing automation platform – it can do autoresponders and much more. It’s simple to set up Mautic to send your visitors an ebook, whitepaper or email course after they’ve opted into your newsletter list. Once you’re more acquainted with the platform, you can even set up branches and smart logic which tailor the messages a contact receives based on what links they’ve clicked and what pages they’ve visited on your website. A. Depending on how many emails you send each month, Mautic can provide substantial savings. Most email service providers’ plans are based on a number of contacts and emails sent per month. With Mautic, there are no monthly fees unless you send, and you can pay as low as $0.10/1,000 emails with plugins such as Amazon SES. Tell us how much you pay for your current email service and approximately how many emails you send per month, and we’ll estimate how much you can save by switching to Mautic. A. Yes, Mautic has a number of built-in email templates and a visual editor you can use to start sending right away. Even a user with no knowledge of HTML is easily able to build, test and send emails. We would be pleased to give you a demo of the platform.